Eye problems are pretty common for people of all ages. It can be something as simple as an irritating allergy or strain from staring at a computer screen for hours on end. However, when seniors have drastic vision changes, there is often something more serious going on. 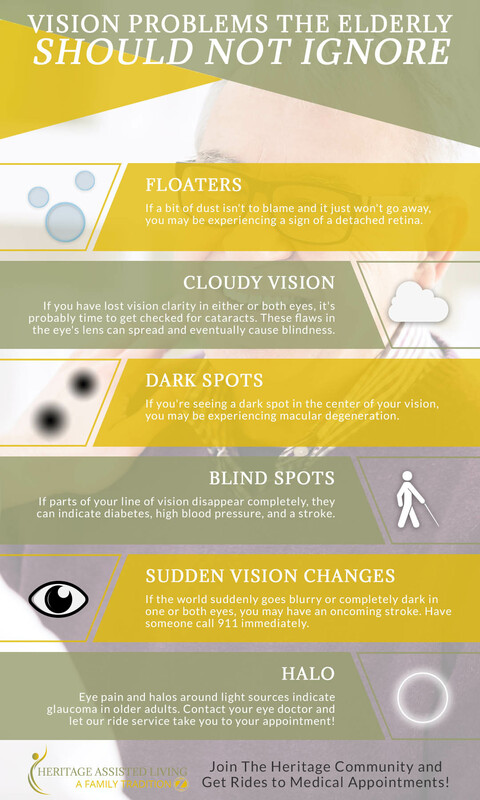 Eyesight changes aren’t just unnerving and inconvenient, they can be secondary symptoms of diseases. In today’s blog, we’re going to explore what common vision changes may mean and if you should see a professional. We’ve all probably experienced these odd spots that never quite come into focus. If a bit of dust isn’t to blame and it just won’t go away, you may be experiencing a sign of a detached retina. If flashes of color or light join the party, chances are even better that you’ve got a serious eye issue and need to contact your eye doctor, who may tell you to go to the emergency room. Vision changes usually happen very gradually. If you wake up one day and realize your vision has lost its clarity in either or both eyes, it’s probably time to get checked for cataracts. These flaws in the eye’s lens aren’t just annoying; they can spread and eventually cause blindness. The good news is, your eye doctor will be able to treat them and get you seeing clearly again! We’ve mentioned flashes of light and color, but if you’re getting the opposite and seeing a dark spot in the center of your vision, you may be experiencing macular degeneration. The leading cause of blindness in seniors, it can also be indicated by trouble reading read signs and identifying colors. Your eye doctor should be notified. If parts of your line of vision disappear completely, it can be a disorienting, unnerving experience. It’s supposed to be! Blind spots can indicate multiple health issues, including diabetes, high blood pressure, and a stroke. Get in touch with your eye doctor as soon as possible for advice on how to proceed. We’ve been talking about changes that take place over time, but if the world suddenly goes blurry or completely dark in one or both eyes, you may have an incoming stroke. Have someone call 911 immediately and do not wait to see if the issue goes away. Time is of the essence when strokes are involved. At our assisted living community, we understand that our residents’ health is paramount to their quality of life. That is why we offer transportation to and from appointments and do everything we can to ensure that accessing healthcare is effortless for our community members. Contact us for a tour in New Jersey today!